Whisk together the flour and milk in a bowl. Toss the cauliflower in the batter until thoroughly coated. Arrange the cauliflower on the baking sheet in a single layer. Bake for 15-20 minutes. While the cauliflower is baking whisk all of the sauce ingredients together. 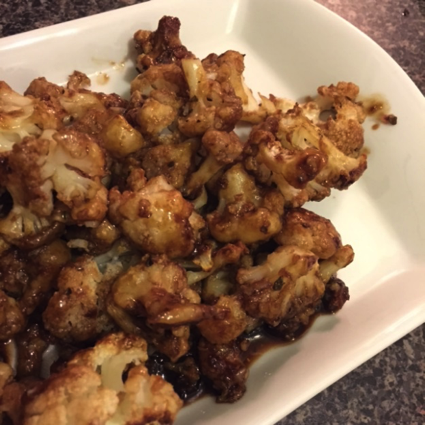 Remove cauliflower from oven and toss in sauce. Return to oven for an additional 6-10 minutes, stirring half way through.